Here it is, time for our third meeting of 2007. We are starting to lay plans for our first Fund Raiser in November 2007. It will be a Soup Dinner chaired by Maria Brugger. There will be many tasks to accomplish to make this a success. Maria and I ask all of our members to be ready to answer the call to help. The money made at this event will provide funding for a permanent site. If and when available, the Old Library Building will require renovating. We have a great slate of officers for 2008. They will be announced at the July meeting. We hope to see you at the next meeting as always the best Pot Luck in the area. April 15 was the "Official" Grand Opening-Ribbon Cutting ceremony for our newly installed Fair Oaks History Center. The F.O. Chamber of Commerce officiated with scissors and ribbon. All who attended enjoyed the displays, social among members and refreshments. On behalf of the F.O.H.S., Warren had a photo opportunity with Sam Crawford, Administrator of the Fair Oaks Recreation and Parks District. They nominated our Society for an Outstanding Organization Award. We won the recognition from the California Association of Recreation and Park Districts. The Brugger's received the award at the Lake Tahoe event. Sam announced the winning at the History Center Ribbon Cutting. Warren received the award at their monthly Board meeting. 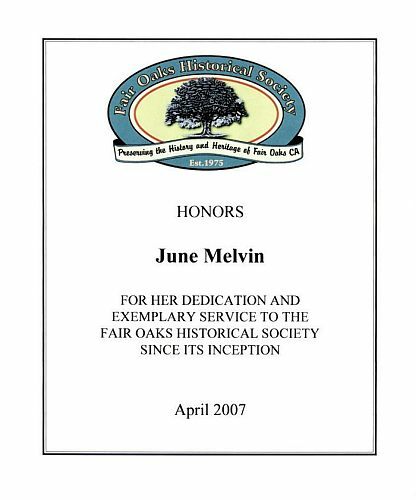 July Program: Jim Pearce, our coordinator for the Fair Oaks Historical Society website, will make a presentation on “New Projects for the Website”. The topics will include the Fair Oaks Books On-line, Historical Maps of Fair Oaks, and Old Homes of Fair Oaks. The presentation will include a computer projection, demonstrating how to access and use the FOHS website. He will be happy to answer your questions as well. The FOHS is very lucky to have someone as dedicated and knowledgeable as Jim Pearce supporting and designing our website. Without Jim’s hard work and dedication, the FOHS would not have made it into the 21st Century with this technology. We are now able to access Fair Oaks' history from around the world with the touch of a few computer keys. I would like to take this opportunity to thank April Lynn Farnham, Curator and Anthropological Historian from the Roseville Maidu Cultural Center, Diana Almendariz AKA “The Tule Lady” and Diana’s daughter, Ooti (which means acorn), for the informative presentation. They spoke about the Northern California Indian culture. They focused on the Nisenan-Maidu people from the 1830s up to the beginning of the Gold Rush and on the Maidu women, Lizzie Enos, Marie Potts, and Bertha Norton, who in the 1900s, were pioneers in the revitalization of their culture. Diana Almendariz is the granddaughter of Bertha Norton and Ooti is Bertha’s great granddaughter. These women opened our eyes to how life was for the Indians of Northern California, and with the continued sharing of their knowledge, the preservation of the culture will continue. As a reminder, if you have a veteran's story to tell please contact me and I will put you in contact with Chip Fong and the Veteran’s History Project. If you have an idea or suggestion for a future program topic, please let me know. I want to bring historical topics of interest to you. You can call me at (916) 944-4812 or e- mail me at sherrywood1949@yahoo.com. Mickey Showers and Dorothy Cabodi were the greeters for our April meeting. How welcoming! Stan Salzman visits the newly located museum, right next door to the general meeting room. The Fair Oaks Spring Fest (Fiesta) was held on May 5 and 6 . The new location of the Historical Society History Center in the Community Club House Fireside Room was very well attended. Approximately 100 people signed the guest book. Many people commented they had not known the Historical Society had a History Center. Thanks to the following people for being docents at this two day event: Diana Lennon, Lois Frazier. Marguerite Goddard, Mickey Showers, Marilyn and Jim Pearce, Lynn Steen, Meg and Larry Smart, and Fran Sargent. 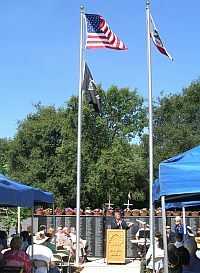 The 9th Annual Memorial Day Ceremony at the Fair Oaks Cemetery was on May 26, 2007.This year was honoring POW'S and MIA'S. The new Veterans Memorial Wall was dedicated. The names of all the Veterans buried in this Cemetery will be engraved on this granite wall by date of burial. 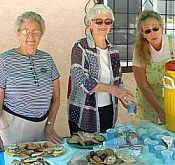 Refreshments were served by the Historical Society and the Fair Oaks/Orangevale Grange. Thanks to all our members who furnished cookies. We have recieved a very nice Certification of Appreciation in recognition of valuable contributions to the Fair Oaks Cemetery Districts Memorial Day Ceremony from the District Board. The History Center is again open every 2nd Sunday from 1:00 to 4:00 P.M. The following people have been docents this year: Diana Lennon, Lois Frazier, Marguerite Goddard, Fran Sargent, Meg and Larry Smart. Thank you. If you would like to be a docent please call 967-2967. The 2nd Sundays in August, September, October and November are available. While June Melvin had been unable to attend our last few meetings, Russ Monroe, Past President, had some unfinished business. 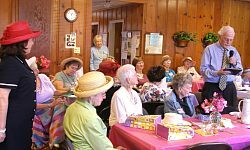 In May,he attended The Woman's Thursday Club Potluck Luncheon which was also honoring June. June's daughter, Carole Brewer, accepted the plaque from the FO Historical Society on June's behalf. It uses our new logo and acknowledges her dedication and service to our society from its inception. We finished making high resolution digital copies of all the glass plate negatives (some 88 in all) and turned over the plates to the Sacramento Archives for safe storage. They were extremely pleased to get them, as they are beginning a search for old photos (and ours are really old) to broaden their collection of pictures of ordinary citizens doing ordinary things. You may have read about their project in the Bee. In the case of our glass plates, they intend to create their own prints of some of them and put up a display in the archive building. It will be known as the Fair Oaks Historical Society Collection. Thanks to Ken Steen for coming down to the museum and helping me recatalogue the photos we have on the walls and in the display cases. They were moved around after our relocation to the Community Clubhouse, and we wanted the inventory to reflect where they went. The Web project, "Fair Oaks History Through Maps" made it up on our website, and we've even added several more old maps. 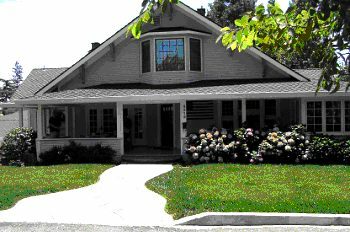 This has encouraged our efforts to archive and display old photos of Fair Oaks classic homes...... but more on that at the July General Membership Meeting, where I'll be giving a presentation on our Internet projects. Hope you can make it...... I'll try and make it interesting. As always; comments, corrections and suggestions are welcome to any of the FOHS Webgroup - Joe Dobrowolski, Jim Pearce, Sherry Wood and Ken Steen. 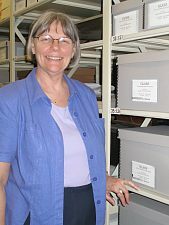 Pat Johnson, Archivist at the Sacramento Archives and Museum Collections Center, gives a us a tour of the massive racks where the collections are stored. The glass plate negatives will be safely stored in their own individual envelopes with pads between each one. Jim signs the necessary paperwork. The By-Law revision is complete with the approval Article VI - Executive Board at our April General Meeting. The By-Laws will be available on the Society's web site. If a hard copy is desired they will be available from the membership committee chair at the general meetings starting in July. The only old photo we have of the house (the corner on the right of the photo), and the John Cunningham family taken in 1920 and generously supplied to us by the Heidt family. Date of Construction: Begun in 1907, the family moved into it in 1911. 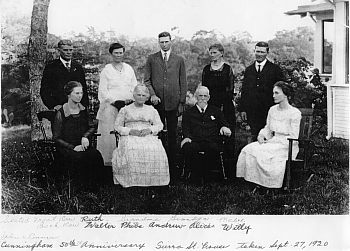 Previous Owners: John & Emma Cunningham; Clarence and Mabel (Cunningham) Collins; Bert Cunningham (John's grandson) and two sons of Clarence Collins by a first wife; Jack and Wendy Turner; three unknown owners; Wendy & Jack Duncan. With great pleasure and curiosity on June 20, eight folks sat around the dining room table to discuss this home's history. The party included the owners, the newsletter staff, Gordon and JoAn Heidt and Lou Crowe, a neighbor for 40 years. Gordon's grandfather was the first owner, after which his Aunt Mabel inherited the home. Mable even took in boarders during the WWII years. Gordon and JoAn both remember visiting the home on many occasions. Gordon's mother, Ruth was one of the 2 daughters and 2 sons raised in this home. In all, John and Emma had ten children. Since 2000, when Merl and Laurie purchased the home, they have maintained the authentic structure much as it was in 1911. In the 1960’s, part of the wraparound porch was converted into a sunroom with Pella wood, double-paned windows. In addition to the living and formal dining rooms, the kitchen has been upgraded but still has that arts and crafts quality. The stove is a reproduction of a wood burning appliance that came with the house. Granite counters, built-in stained glass windows and a china cabinet have enhanced the room. The home has 4 bedrooms, 3 bathrooms and a spacious basement area used as a recreation room. The master bedroom suite upstairs encompasses the entire floor with an open-tiled shower and sitting area. Gorden remembers that when he was a child, the attic was a storage area. Paneling in the hallway and two stairwells is the original redwood. As you can see, this home is well loved and cared for including the surrounding gardens. The Susmilch 's were so gracious to invite us for this exchange of history. May they continue to enjoy many years of happiness with their family on Sierra Street.